هتل هبتور گرند بیچ ریزورت اند اسپا، هتلی 5 ستاره می باشد که در ساحل جمیرا ساخته شده است. در مجاورت هتل هبتور گرند بیچ ریزورت اند اسپا، مرکز خرید مارینا دبی قرار گرفته است. میهمانان برای رسیدن به مرکز خرید امارات، احتیاج به 10 دقیقه رانندگی دارند. فرودگاه بین المللی دبی نیز در فاصله زمانی 30 دقیقه‌ای هتل هبتور گرند بیچ ریزورت اند اسپا قرار گرفته است. سالن اسپا و تندرستی Elixir Spa، در هتل هبتور گرند بیچ ریزورت اند اسپا خدمات متعدد ریلکس کردن بدن و گرفتن خستگی در کنار خدمات زیبایی ارائه می‌گردد. علاقه‌مندان به ورزش‌های تنیس، اسکواش و راکت‌بال حتما سری به سالن‌ و زمین‌های مخصوص این ورزش‌ها در هتل هبتور گرند بیچ ریزورت اند اسپا بزنند. سه استخر مخصوص بزرگسالان، استخر مخصوص کودکان با سطح بندی عمق آن، رستوران و کافی‌شاپ‌های متعدد، باشگاه تناسب اندام، فضای رایگان برای پارک خودرو و ... بخشی از خدمات و امکانات رفاهی هتل هبتور گرند بیچ ریزورت اند اسپا محسوب می‌شوند. تمامی اتاق‌ها و سویی‌های هتل، به طور خاص دکور شده اند. منظره بعضی از اتاق‌ها رو به دریا و باقی رو به باغ هتل هبتور گرند بیچ ریزورت اند اسپا می باشد. تمامی اتاق‌های هتل مجهز به سیستم تهویه مطبوع، تلویزیون صفحه تخت، اینترنت رایگان پرسرعت، اتو و میز آن، میز مطالعه و مبل‌های راحت است. در حمام هر اتاق نیز، وان به همراه دوش مجزا، سشوار، وسایل بهداشتی و آرایشی برای هر نفر تعبیه شده است. تعداد اتاق و سوییت‌های هتل هبتور گرند بیچ ریزورت اند اسپا 446 عدد است. هتل لوکس و مجلل هبتور گرند بیچ ریزورت اند اسپا دارای چندین رستوران و کافی شاپ است که نسبت به ارائه انواع غذاهای بین المللی، ایتالیایی، انگلیسی و ... اقدام نموده‌ اند. سرآشپزان رستوران BAMBOO KITCHEN متخصص در پخت انواع غذاهای تایلندی هستند. طرفداران غذاهای ایتالیایی حتما سری به رستوران LUCIANO'S که در نزدیکی استخر هتل هبتور گرند بیچ ریزورت اند اسپا است، بزنند. کافه-بار POLO BAR نیز طیف وسیعی از نوشیدنی‌های گرم و سرد و کوکتل‌ها را در فضایی کاملا دوستانه و صمیمی ارائه می‌کند. در کافی‌شاپ THE UNDERGROUND PUB انواع غذاهای فست فودی در کنار نوشیدنی‌های خوشمزه سرو می‌گردد. علاقه‌مندان غذاهای عربی مخصوصا لبنانی، حتما سری به رستوران AL BASHA بزنند. زوج‌های جوان نیز می‌توانند به رستوران دو نفره 4TWO مراجعه نمایند که با دکوراسیونی عالی و غذاهایی خاص و دلچسب، خاطره‌ای فراموش نشدنی از یک شب زیبا را برای آنها می‌سازند. درصد کمی از میهمانان هتل هبتور گرند بیچ ریزورت اند اسپا، از خدمات هتل ابراز نارضایتی کرده اند و علت اصلی و مشترک این عده معدود، برخورد نه چندان خوب و خدمات ضعیف کارکنان هتل هبتور گرند بیچ ریزورت اند اسپا بوده است. هتل هبتور گرند بیچ ریزورت اند اسپا را به صورت آنلاین رزرو کنید! The 446 spacious and bright rooms are equipped with 24 hours room service, in-room massage available, surcharge in-room childcare, flat screen TV with satellite TV service, premium TV channels, private bathroom with tub and shower combination, designer toiletries, slippers, hairdryer, bathrobes, in-room safe, blackout drapes, mini-bar, iron and ironing board, cribs/infant beds available, rollaway/extra beds available, climate control, air conditioning, daily housekeeping, and paid Wi-Fi. Check-in time starts at 3 PM and check-out time is 12 noon. * Habtoor Grand Beach Resort & Spa features 442 climate-controlled guestrooms, all of which include elegant, light decor with Arabian touches and soft, fabric-covered furnishings including sofas. 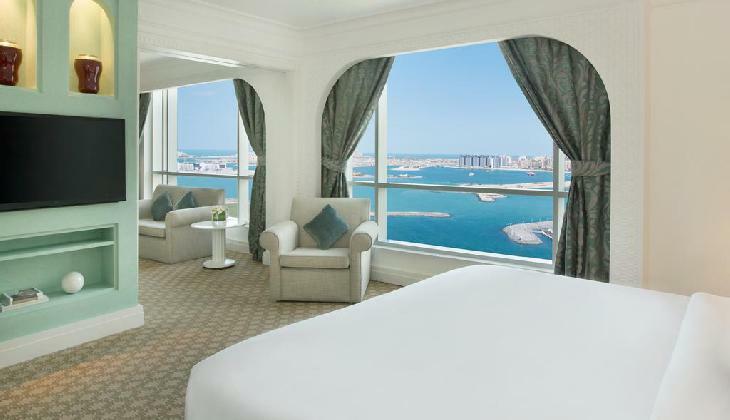 * Rooms overlook the Arabian Gulf or adjacent landscaped gardens and feature flatscreen cable TVs with DVD players, high-speed Internet connections, and minibars. Contemporary, marine-coloured bathrooms come with tubs, bathrobes, and designer toiletries. At Habtoor Grand Beach Resort & Spa travelers can benefit from private beach area, 24 hour front desk, tours and tickets assistance, express check-in and check-out, luggage storage, laundry and dry cleaning services, concierge services, tour desk, car hire, babysitting and childcare services, business center, beauty shop, meeting and banquet facilities, wedding services, fax and copy services, terrace, outdoor pool, water sport facilities, tennis court, garden, spa & wellness center, kid’s club and playground, Turkish bath, sauna, free private parking, multilingual staff, fitness center, water park, nightclub, restaurants, bars & lounge, safety deposit box, designated smoking area, shopping on site, newspapers, and free public Wi-Fi. The hotel offers a variety of leisure & recreational facilities. There are 2 flood lit tennis courts, 2 glass walled squash courts, fitness gym with extensive range of cardiovascular equipment, beach football and beach volleyball. Guests will have full access to a host of water sports activities, such as windsurfing, water skiing, jet skiing and scuba diving all under the watchful eyes of professional instructors. * Mun Chi: Contemporary Asian fusion dishes served in an Oriental-style surroundings, set amongst the gardens and overlooking the Arabian Gulf. 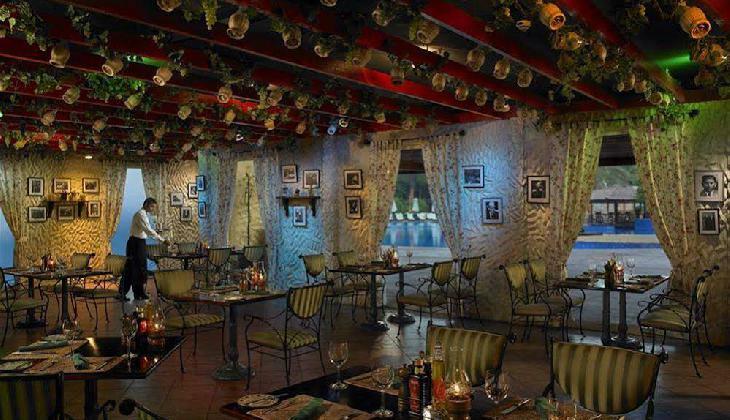 * Luciano’s: Italian restaurant serving a range of pasta, risotto, and seafood dishes, offering al fresco dining. * Al Manara: Casual, beachfront restaurant offers snacks and drinks. 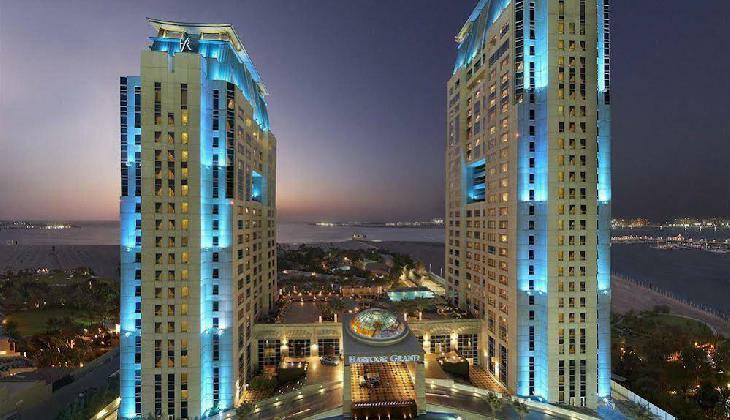 Habtoor Grand Beach Resort & Spa is a luxurious resort and spa located in Dubai, UAE. The hotel is close to Dubai Marina Mall, Skydive Dubai, and Dubai Marina. It is a 5 stars hotel where you can enjoy high-class services and accommodation, making the place a nice choice for both leisure and business travelers. Habtoor Grand Beach Resort & Spa is a 25 story building which offers a spa & wellness center and 3 swimming pools from where you can admire the Arabian Gulf and the beautiful, exotic surroundings. It is nicely situated on Jumeirah Beach, next to Dubai Marina and close to several tourist attractions and public transportation. The hotel is within easy access as it is next to a main road and minutes of walking distance from a bus station. Dubai International Airport is 27.9 km / 17.4 miles away from the hotel, being the closest airport. From the airport there are taxis and public transportation that can get you to the hotel. Check our list of attractions nearby Habtoor Grand Beach Resort & Spa: Emirates Golf Club, Dubai Marina Mall, Skydive Dubai, Dubai Marina, American University of Dubai (AUD), Ibn Battuta Mall, Mall of the Emirates, Knowledge Village, Aquaventure Waterpark, Wild Wadi Water Park, Burj Khalifa, Ski Dubai, and Dubai Mall. Further away guest can visit Dubai Zoo, Arabian Ranches, Trade Center, Global Village, Raffles Botanical Garden, Wonderland, Dubai Museum, Port Saeed, Dubai International Art Centre, Dubai Opera House, Heritage and Diving Village, Dubai Fountain, Dubai Autodrome, and Mercato Shopping Mall.